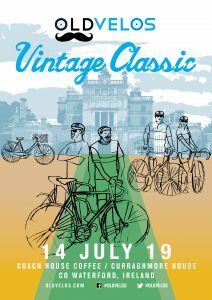 This year we will be the 5th year of the OldVelos Vintage Classic. Due to interest from leisure cyclists and 'High Nellie' enthusiasts we are also running an event especially for them which we are calling the Tweed & Twine Cycle. The dates for these events is the 13th and 14th of July 2019. The OldVelos Vintage Classic will start and finish at Coach House Coffee on the Waterford Greenway on the 14th July. There will be a barbeque for all participants at the finish (with vegetarian options). There are two routes 'The Curraghmore Loop' (45 miles, 70kms approx) for sporting cyclists and the 'Wild Comeragh Challange' (75 miles, 120 kms) for the serious enthusiasts. The Tweed & Twine Cycle will start at Coach Coffee on the 13th July and follow the Greenway route before heading to Curragmore House for a picnic on the grounds. This will be a round trip of 25 miles (40 kms). The popular 'Concours d'Elegance' competion will be on the Saturday with final judging at 5 o'clock. Entrance to this competion is free for participants in the OldVelos Vintage Classic.